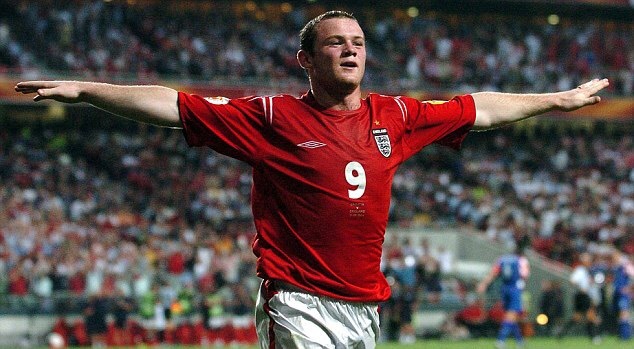 Wayne Rooney’s performances would be the standout memory of England’s Euro 2004. England headed to Portugal having won their qualifying group with an unbeaten record, clinching their finals place with a tense 0-0 draw away to Turkey in the final game. There was a belief England could challenge for Euro 2004 glory, with a settled squad of players who mostly had age on their side. Gary Neville and Steven Gerrard, who had both missed the 2002 World Cup through injury, were fit this time around and a new star had burst onto the scene. Eighteen-year-old Everton forward Wayne Rooney was proving a genuinely exciting talent and by the time of the Euros he had already been playing for his country for 16 months. Now he had the chance to become well-known across Europe. Other players to have broken into the set-up in the past two years included Chelsea’s Frank Lampard and John Terry. Veterans such as David Seaman and Teddy Sheringham had left the international scene since the 2002 World Cup, but the most significant absentee from England’s Euro 2004 squad was Rio Ferdinand. The Manchester United defender had been banned from playing football since missing a drugs test the previous September, with the controversy having overshadowed the build-up to the decisive qualifier in Turkey. Terry and Ledley King would contest the right to partner Sol Campbell in the centre of defence in Ferdinand’s absence. 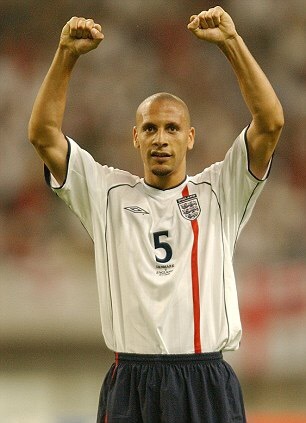 England would be without the banned Rio Ferdinand for Euro 2004. 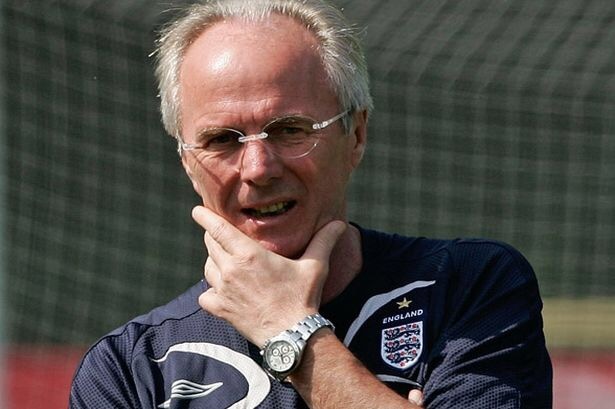 Since Sven-Göran Eriksson had taken over as England boss in January 2001 – initially attracting opposition from some quarters as he wasn’t English – there had become a feelgood factor surrounding the national team, with joyful wins against Germany and Argentina recorded along the way. Thousands of England fans were heading to Portugal for the finals, making most games feel like home fixtures. Euro 2004 appeared to represent as good a chance as any for the new-found ‘Golden Generation’ to end the long wait. To help their cause, no side at the finals looked unbeatable. France were favourites and holders but they had lost their armour of invincibility with group stage elimination at the 2002 World Cup; Germany were in transition and had looked unusually vulnerable in recent years; Italy were unpredictable, having lost to Wales during qualifying; and Spain were still considered underachievers with their glory years yet to come. England could be placed in the same bracket as nations including the Czech Republic, the Netherlands and hosts Portugal – they were in with a decent shout provided all went to plan. After qualifying in October, England’s results had been patchy as they prepared for the finals. A 6-1 thrashing of Iceland was their only win, having drawn with Portugal and Japan and lost to Denmark and Sweden. The Euro 2004 draw placed England in Group B with holders France, Croatia and Switzerland. Although starting with a game against the French was probably not what England would have wished for, they stood a good chance of progressing to the quarter-finals and potentially further. On the second night of the tournament, England took on France in Lisbon. As England so often do in their opening games at major competitions, they struck first as Lampard headed in Beckham’s free-kick. All was going to plan and in the second half they were handed the perfect chance to wrap up the win after a powerful run by Rooney ended with him being fouled in the area. But Beckham’s spot-kick was saved by his former Manchester United team-mate Fabien Barthez. Frank Lampard puts England ahead against France. Despite this blow, England still seemed on course for a memorable victory against a side containing Zinedine Zidane, Patrick Vieira and Thierry Henry. ITV commentator Clive Tyldesley jumped the gun, pointing out how France’s Tottenham Hotspur-bound boss Jacques Santini could be taunted with “1-0” chants in the coming season. It was the kiss of death. In the final minute, Emile Heskey conceded a free-kick just outside the box. Zidane underlined his ability by curling the ball into the bottom corner of the net with David James stranded. Zinedine Zidane scores France’s winner from the penalty spot. England seemed shaken by the goal and deep in stoppage time Gerrard played a fatal backpass towards James. Henry got in first and James brought him down in the area. Zidane scored from the spot and England had somehow contrived to lose 2-1 in a game they had looked destined to win. “Afterwards my head was pounding with ‘what ifs’. We were devastated. I still am. In the post-match press conference I said we hadn’t been shown any footage of Zidane taking free-kicks or penalties. I don’t think the FA thanked me for saying that, but it was the truth. It wasn’t a premeditated comment, I just responded honestly to the question. In some ways it took the focus off the result – if the media hadn’t had that to go on they would have found something else to pick at.” David James speaking in 2012 as he reflected on the aftermath of the France match. With Croatia and Switzerland having drawn their opening game, England still stood a strong chance of progressing – but they needed to get a result against the Swiss in their second match in the heat of Coimbra. England began nervously and it was against the run of play they took the lead on 23 minutes. Michael Owen crossed for Rooney to head home from close range – in the process becoming the youngest ever scorer in the European Championship, although he would only hold the record for four days. In the second half Switzerland were reduced to 10 men when Bernt Haas was red-carded. Rooney would seal the win, although his effort could have been classed as an own goal as it struck the post before going in off Swiss goalkeeper Joerg Stiel. A third goal from Gerrard added gloss to England’s victory. Although 3-0 flattered them, England had claimed a win when they most needed it. Croatia and France drew that night to leave England needing only a draw in their final game against the Croatians to advance, while still having a chance of topping the group. 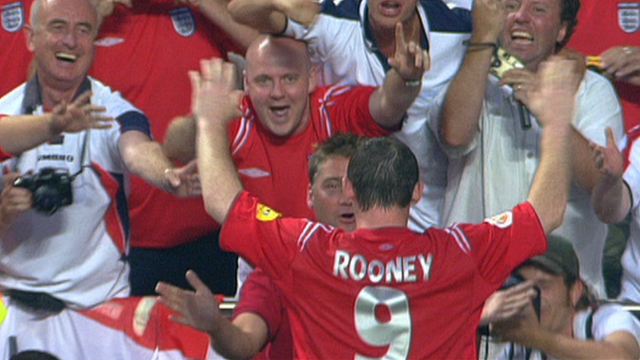 Wayne Rooney celebrates scoring against Croatia. If there was excitement over Rooney after the Switzerland game, then it turned into hysteria after the match against Croatia. Backed by a tremendous support in Lisbon, England enjoyed an enthralling 4-2 win with Rooney scoring two well-taken goals. Although they fell behind early on, England recovered to achieve their win with Paul Scholes ending his three-year international scoring drought and Lampard wrapping up the success. It had been a good night that emphasised England’s attacking strengths, the only downside being they missed out on top spot after France beat Switzerland 3-1. But for the first time England had progressed from a European Championship group on foreign soil, with all the talk being about their 18-year-old star who seemed totally unfazed by the challenges of a major tournament. “I don’t remember anyone making such an impact on a tournament since Pele in the 1958 World Cup in Sweden,” purred Eriksson about Rooney. Now came the next challenge: a quarter-final clash with hosts Portugal three nights later in the same stadium. Portugal had come close to bowing out at the first hurdle, needing to beat rivals Spain in their final group game to stay in the competition. Both England and Portugal had reason to believe this could be their year, with Portugese star Luis Figo knowing this might represent his best chance to win silverware at international level. Four years earlier he had scored as Portugal came from behind to beat England 3-2 at Euro 2000. This match would again see Eriksson come up against Luiz Felipe Scolari, who had been in charge of Brazil when they knocked England out at the same stage of the World Cup two years earlier. Sharing the stage with Rooney was another much-hyped teenager – Manchester United’s Cristiano Ronaldo. With the game just three minutes old, Owen instinctively flicked the ball past goalkeeper Ricardo to put England ahead as he scored for the fourth major tournament in a row. But before the half-hour mark Rooney went off injured and some of England’s momentum seemed to go with him. They appeared increasingly defensive as the game progressed, unconvincingly holding on to their one goal lead. With seven minutes left they were finally undone. Helder Postiga, brought on for Figo, headed past James – this coming after he had scored just one league goal during the previous season with Tottenham Hotspur. For the second time in the tournament, England had been punished when seeking to protect a 1-0 lead late on. But they went back on the attack and they thought they had snatched victory in the final minute, as Swiss referee Urs Meier took centre stage. Owen struck the crossbar from Beckham’s free-kick and Campbell forced the ball home. But Meier ruled that Terry had impeded Ricardo and the effort was ruled out. It was cruel on Campbell, who had also had a ‘winner’ disallowed against Argentina at the 1998 World Cup. Frank Lampard equalises for England against Portugal. England now had to raise themselves for extra-time, having already brought on three substitutes. After a goalless first period of extra-time, England fell behind with 10 minutes left. Rui Costa fired an unstoppable shot off that went in off the underside of the bar. But again conceding seemed to galvanise England, Lampard scoring his third of the tournament to pull them level five minutes from time. Once again, penalties would be needed to settle an England tournament match. That familiar painful feeling as England once more bow out on penalties. By England’s poor standards this was one of their better shoot-outs, twice putting Portugal in a position where they had to score to stay in the contest. But that was of little consolation as for the fourth time they exited a major tournament on spot-kicks, losing 6-5 in the shoot-out. Beckham continued his dismal recent penalty record by firing England’s first effort over, amid suggestions the penalty spot had moved (‘Sod It’ screamed the back page headline in the Daily Mirror). During sudden death, Vassell saw his effort saved by Ricardo – who then in turn scored past opposite number James to end England’s dream. Portugal reached the final but they came undone against Greece, as the outsiders surprisingly lifted the trophy. 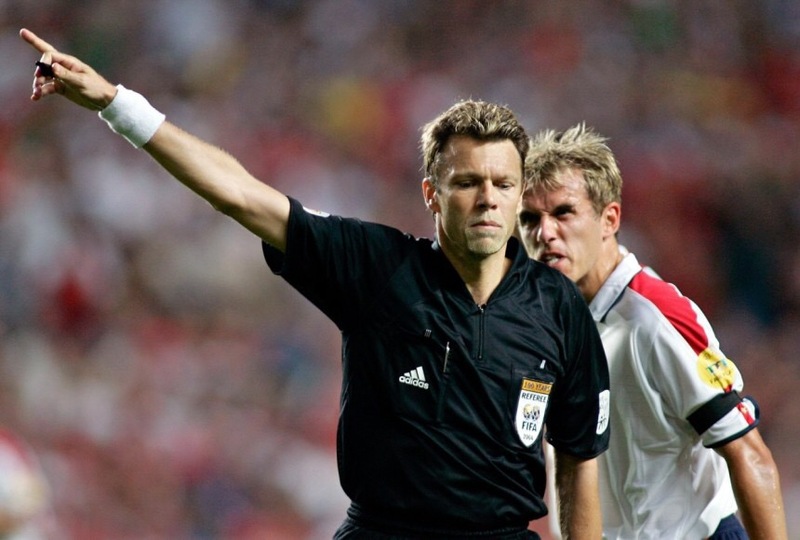 One man who probably wished England had prevailed was referee Meier, given the abuse he was about to receive. His decision to disallow Campbell’s goal would have been largely forgotten and forgiven had England progressed, but their exit led to the inevitable hunt for a scapegoat. The tabloid press swiftly chose one, as Meier found himself facing a barrage of criticism – particularly from The Sun which overstepped the mark by encouraging readers to send him emails (Meier claimed he found thousands in his inbox the morning after the match). He had to go into hiding with police protection after saying he received death threats. Although it was open to debate whether Meier had got his decision right (UEFA insisted he had), he certainly did not deserve to have to put up with such threats and The Sun continued its campaign against him by placing a giant English flag near his home. Eriksson wrote in his autobiography of Meier’s treatment: “When I heard what had happened, I called him on behalf of the England team. There was no excuse for that kind of behaviour.” In a tournament where their fans had largely conducted themselves well, it was a section of the tabloid press which had dimmed England’s reputation. Urs Meier felt the full force of the English tabloids after the nation’s exit from Euro 2004. Despite the individual talent available, finding the correct midfield combination was proving difficult and the tournament really marked the start of the Gerrard/Lampard conundrum that would remain unresolved for years. Successfully resolving the left-sided problem in midfield also continually appeared a challenge to Eriksson. Captain Beckham’s performances came in for criticism and not just because of the missed penalties. Doubts were starting to be cast about Sven-Göran Eriksson. Had England advanced they would have had to play out the rest of the tournament without Rooney, whose foot injury would rule him out until September. By that point he had moved on to Manchester United in a big money move, his stock having risen during the Euros. But one of his new club team-mates would no longer be playing alongside him for England, as Paul Scholes announced his international retirement at the age of 29. And to cap everything that summer there was ‘Fariagate’, a scandal which did the FA no favours. Eriksson remained in charge after being cleared of any wrongdoing but there was now increasing pressure on him to succeed with England at the 2006 World Cup. Euro 2004 had represented a golden opportunity for England to finally win a major tournament again and it had been squandered.